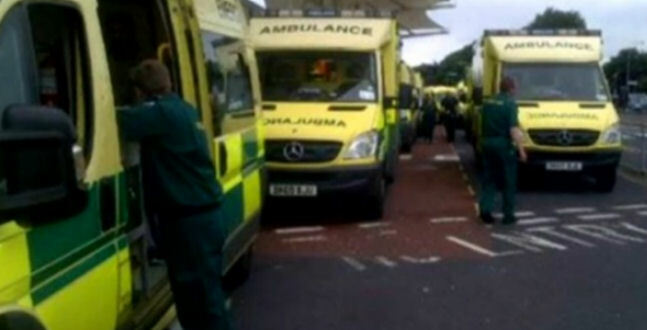 Ambulances waiting outside hospitals are 'delays' that cost lives. Paramedics and ambulances outside a hospital cannot tend to other emergencies until the patient is handed over and signed-off at the hospital. The Lancashire Teaching Hospitals NHS foundation Trust, responsible for Preston and Chorley hospitals, made a decision to [temporarily] close the A&E at their Chorley site in April due to a shortage of middle-grade doctors. 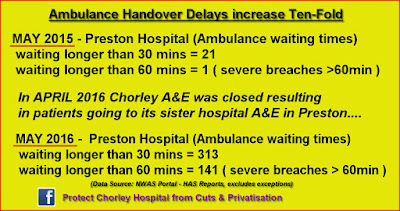 APRIL 2016: Before Chorley A&E was closed there were 43 Severe handover breaches >60 min at Preston hospital. 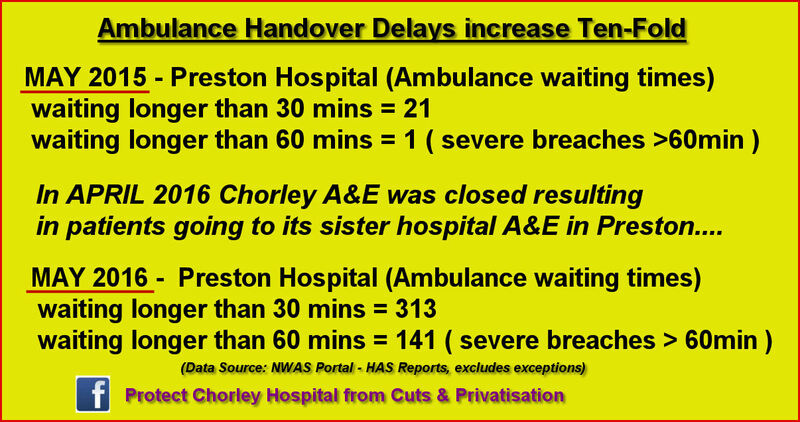 MAY 2016: After Chorley A&E was closed there were 141 Severe handover breaches >60 min at Preston hospital. That's a huge 228% increase in Ambulance delays (severe breaches) at the Royal Preston hospital only a few weeks after the closure of Chorley A&E in April. Only last week, Lancashire county Councillor Steve Holgate reported over 15 Ambulances queuing outside Preston hospital. The Lancashire Teaching Hospitals NHS Trust said allegations of excess ambulances outside Preston hospital were 'unfounded'. The facts presented by the North West Ambulance Trust today clearly highlight how out of touch the Lancashire teaching hospitals trust are, and they can no longer fool the public of their mis-management that has led to this crisis. From above we can see that in May 2015 there were 21 thirty-minute handover breaches. The North West Ambulance Service (NWAS) also show that whilst there has been an increase in ambulances attending the Royal Preston Hospital, other hospitals have also been affected by the closure of the A&E at Chorley. When the Chorley A&E closed in April, the attendances at Wigan hospital arriving by ambulance went from 14 to 83 in a few weeks. A 493% increase in patients attending Wigan hospital by ambulance! There is now no doubt that the closure of the A&E at Chorley & South Ribble Hospital has led to a crisis at neighbouring hospitals. Figures released earlier by NWAS show that A&E attendances year on year are at an all time high and that in the last 12 months alone attendances at A&E departments in Lancashire have risen by over 20%. The Royal College of Emergency Medicine state that the A&E attendances via ambulance clearly show that replacing A&E's with Urgent Care Centres in most cases simply increases attendances at other hospitals and contributes to an increased risk to patients. The fight to re-open the A&E at Chorley & South Ribble hospital is no longer confined to Chorley. Clearly the knock-on effect of closing the A&E at Chorley has consequences on much wider areas such as Blackburn, Wigan, Preston and beyond. 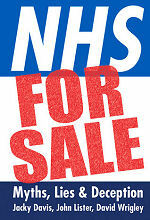 The battle is now on for an all out Rally to STOP THIS LUNACY and gain back control of our NHS! This does not fit with KP's statement saying the knock on effect of closing Chorley A&E would have only minimal effect on other Emergency Departments. She got this wrong, what else did she get wrong?